Well, yeah. Yes I did. But apparently she didn't. She had been painstakingly creating segments of all the specific people she wanted to target with each message. The news that you could easily tell Aweber “send to my two interest lists, but exclude anyone who has purchased my product” was an epiphany. I was like, “that is a perfect Cloud Coach post”. You can be like a surgeon with your email lists. And I encourage you to do so. On Cloud Coach, I have two (or more) very distinct audiences. I have people who are learning how to use technology (particularly email marketing) to grow their offline businesses. And then I have others who are drowning in email, and are learning some pretty ninja ways to get un-drowning. You could imagine that the email marketing people might not be interested in the stuff that the drowning in email people are. Prerequisite: You need to have more than one list in Aweber. There's no reason you shouldn't have more than one list. They don't charge you per list, they charge you per subscriber. So go ahead and make lots of email lists for different things. Step One: Create a new broadcast message. To my knowledge, you can't exclude FollowUp messages. Write a good one. It's brilliant, right? Good, your people will love it. Step Three: Now you can choose which other lists to either include or exclude. Here's the best part. If someone is already subscribed to one list, and you include another list they're also subscribed to, they'll still only receive one copy of your message. Yes, Aweber automatically takes care of that. And here's the automagical part: when you select a list to exclude, anyone who is subscribed to the list your are sending to will be left out if they are subscribed to the exclude list. Again, I'm coming back to my first example. 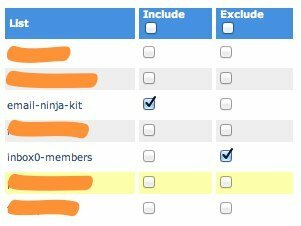 When I'm sending out promotional stuff for the Inbox Zero Training Program, I make sure to include the list that people get to join when they buy. That way buyers don't get marketing emails, and potential buyers, get the goods. Yes, Mailchimp does have a kind of similar feature that you can read about here. But it doesn't look like it will easily segment one list against another. 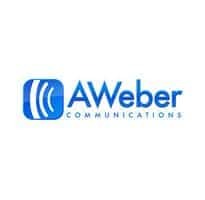 I don't think it's as simple as Aweber. Just another reason to pay for your email provider (Sorry, that is a cheap shot at Mailchimp. They are actually a great email list provider and they give away a staggeringly amazing service for free). Every Thursday, I'll be answering your tech questions here on the Cloud Coach Blog. Yours could be featured. What are some questions that you have about email lists? Don't forget to leave a comment!